Mark Newton-Jones sailed in the ARC Challenge – Gran Canaria to Saint Lucia over 17 days and nights – to raise money for Children with Cancer UK and the Fashion & Textile Children’s Trust. I try to do an event each year to raise money for children’s charities. In 2013, I chose Children with Cancer UK and the Fashion & Textile Children’s Trust. I had a one-off to challenge myself to something bigger than a marathon or the Three Peaks Challenge! Scary as it is, I signed up to sail across the Atlantic in the largest ocean race in the world – The ARC. 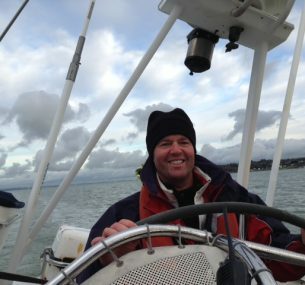 On 25 November 2013, we set off to sail the circa 2,800 Nautical Miles on a 72ft yacht called Challenger 3, handling whatever conditions come our way. I was one of a crew of 10 novices, but thankfully our skipper is fully qualified. Our first training session, and the first time we met each other, was on 8 November. I’m not a complete novice to the water. I’ve been around boats for most of my life, but I’ve never been out of site of land for more than eight hours at a stretch. It was both exciting and frightening! I’m hoping to raise a substantial sum for Children with Cancer UK. They are based in Great Ormond Street and fund amazing research to improve the chances of survival and recovery from childhood cancers. My second charity is the Fashion & Textile Children’s Trust. They support disadvantaged children whose parents or carers work in the UK fashion and textile industry. We made it across the Atlantic and we are safely ashore. The sense of elation and achievement is quite overwhelming. We covered 3,006 nautical miles in 18 days, 23hrs and 18 minutes, coming in on 12 December. Of the total fleet of circa 250 yachts, we finished 60th. The experience was quite amazing. Thankfully our boat, Challenger 3, coped with everything the Atlantic threw at her. The first steps on hard ground were very odd indeed, after almost three weeks at sea, but the beer and rum punch soon replaced any swaying from the ocean! So back to normal life now after this incredible adventure. Thank you once again for your kind generosity, words can’t really express how grateful I am and the same is true on behalf of the two charities, Children with Cancer UK and Fashion & Textile Children’s trust. You’ve pulled together and raised over £31k and it’s rising by the day. Many, many thanks. Thank you Mark for all your efforts!